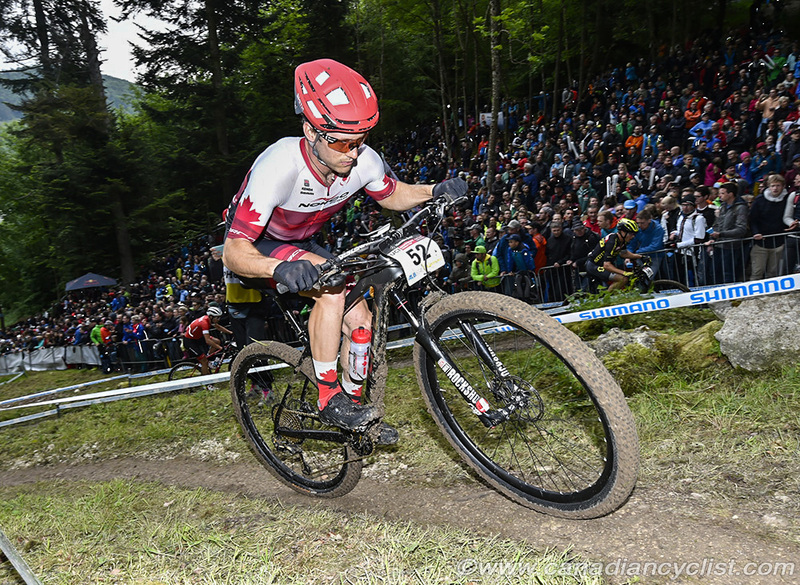 It was Swiss world champion day on Sunday, at Round 2 of the Mountain Bike World Cup in Albstadt, Germany. 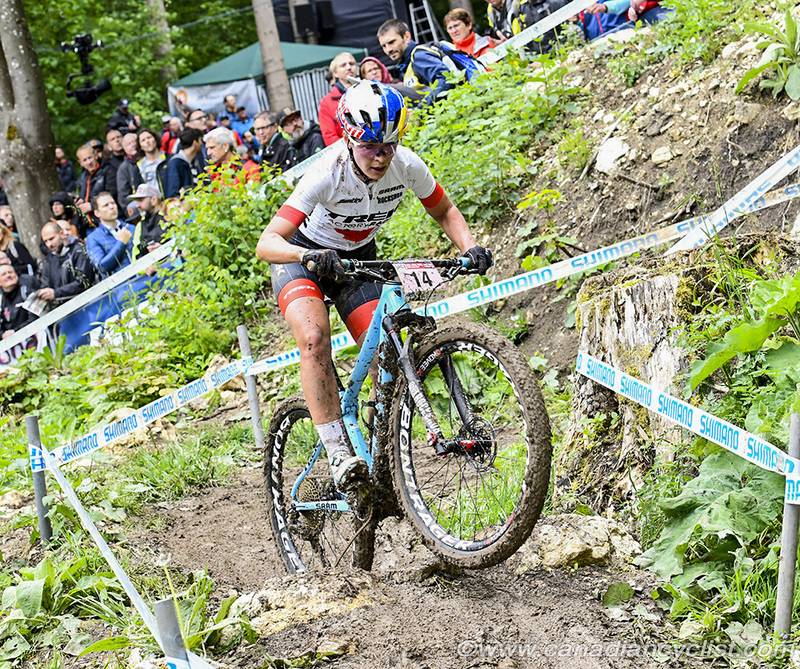 All three of the races contested were won by the reigning world champion, and all three were Swiss, with Jolanda Neff (Kross Racing) winning Elite women, Nino Schurter (Scott-SRAM) winning Elite men and Sina Frei (Ghost Factory) taking Under-23 women. All three also moved into the World Cup leader's jersey with their wins. 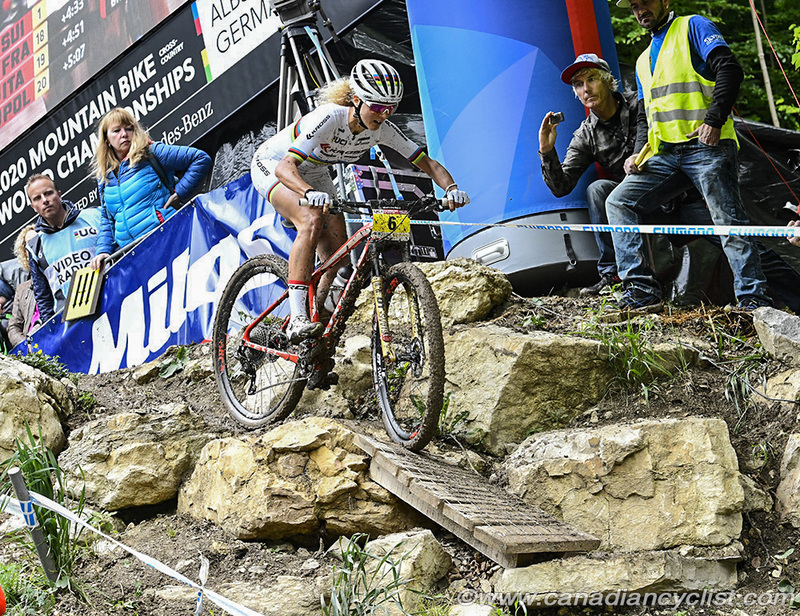 Canadian riders had some strong results, with Emily Batty (Trek Factory) finishing 13th and Sandra Walter (Canadian National) 15th - her best-ever European World Cup result. In the Elite men's race, national champion Peter Disera (Norco Factory) cracked the top-30, finishing 28th. 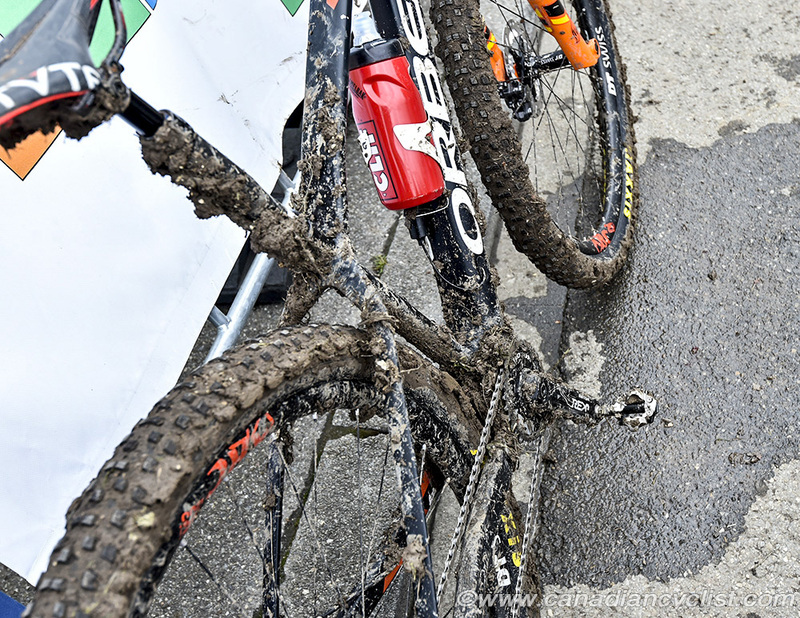 Rain through the week and on the morning of the race made the circuit muddy and slick, with almost every rider in the Under-23 and Elite women's races crashing at least once on the steep and technical descents. By the time the Elite men rode in the afternoon, the track was starting to dry up a bit and they did not face the same conditions. Neff seemed to relish the conditions, and was already 30 seconds ahead of the rest of the women's field by the end of the start loop. Catharine Pendrel (Clif Pro Team) had a strong start, and was in seventh place after the start loop, but went down hard on one of the dropoffs, falling to the mid-teens before finishing 19th. Alessandra Keller (Thomus-RN Racing) spent most of the racing chasing Neff solo in second place, until the final lap, when she was caught by defending World Cup champion Yana Belomoina (CST Sandd American Eagle) and Anne Tauber (CST Sandd American Eagle), who took second and third, still over two minutes behind Neff. "The conditions were my best friend today," said Neff. "When I heard that it was going to be muddy and rainy, I was the happiest person on earth. I love these condition and I love mountain biking. Today we had a real mountain bike race and I loved every second. A two minute gap [over second place] was my goal. I knew the conditions were going to play in my favour. It was like La Bresse [France] a couple years ago, we had similar conditions and I loved it. I knew if I could be the first through the downhills I could use it to my advantage. I just tried to be in front and from there it went all smooth." Batty rode a consistent race in the low-teens, with one crash of her own, while Walter moved up from 46th on the start grid to the top-25 in the start loop. A strong second lap put her into 16th, and she maintained her standing for the remainder of the race. "That was the definition of thick, heavy mud," said Batty. "I think my bike is weighing at least 29-30 pounds right now. It was a solid race; I was in the top spots but I was riding pretty clean with only one mistake. Through the race the mud got more dry and tacky, so the wheels were so heavy and you had to muscle the bike around. All in all, I thought it was a pretty decent race." "I ride in the mud all winter," said Walter, "so when it starts getting crazy I know these are my conditions. I had a lot of fun out there. I definitely didn't race a super clean race, but I felt confident and didn't make too many mistakes. I'm really excited [with 15th] and thankful to the Canadian team and the staff for making it such a great project." 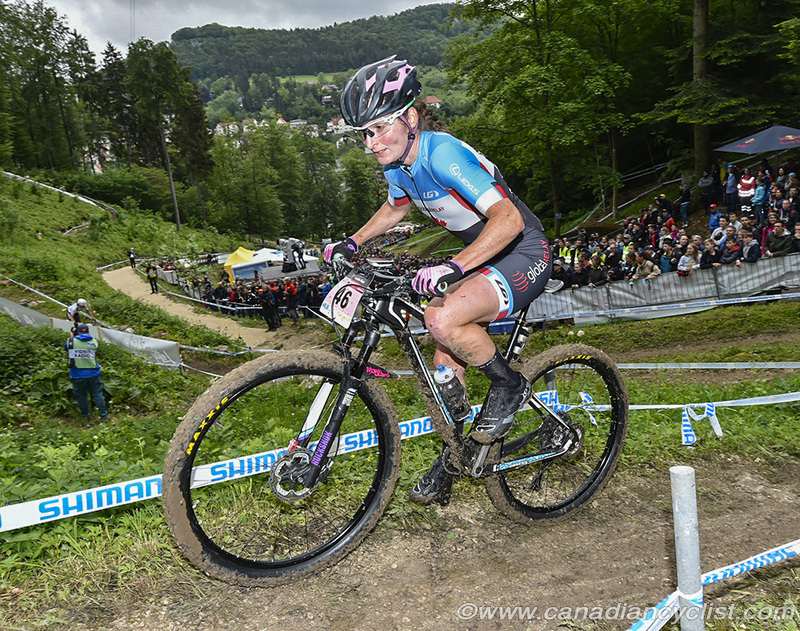 In other Canadian results, Cindy Montambault was 42nd, Haley Smith (Norco Factory), who crashed hard on one of the drops, was 50th, and Catherine Fleury (Canadian National) was 64th. Neff jumped from sixth to first in the standings with 480 points, while Round 1 winner Annika Langvad (Specialized) fell to second after struggling in the muddy conditions, finishing 29th. Tauber remains in third place. Batty moves up one spot to 13th, while Pendrel drops from seventh to 14th. Smith drops from 23rd to 34th, Walter debuts at 37th and Montambault is 39th. In the Under-23 women, Frei took the lead from the start and never looked back, setting the fastest lap times on all but one lap. Evie Richards (Trek Factory) slotted into second for the entire race, with Round 1 winner Malene Degn (Ghost Factory) in third. Laurie Arseneault was the top Canadian in 27th, followed by Juliette Tetreault in 32nd, Mackenzie Myatt (Canadian National) 40th and Anne Julie Tremblay (Canadian National) 48th. Nino Schurter definitely had something to prove in the Elite men's race. He had lost the first round of 2018 after sweeping the Series in 2017, and then did not finish the Short Track race on Friday, relegating him to the third row of the start grid. 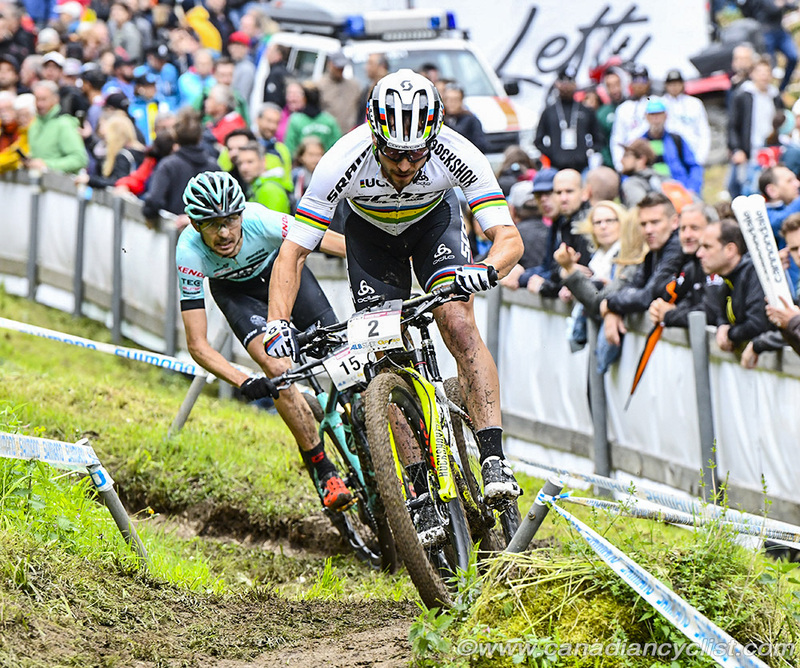 By the end of the start loop, Schurter was firmly in control at the front of the race. He was joined for the first laps by cyclo-cross pro turned mountain biker Mathieu van der Poel (Corendon-Circus), Maxime Marotte (Cannondale Factory), Mathias Flueckiger (Thomus-RN Racing), Lars Forster (BMC) and Round 1 winner Sam Gaze (Specialized). Gaze flatted and eventually dropped out of the race, while Flueckiger also flatted and Forster could not handle the pace, and were replaced by Stephane Tempier (Bianchi Countervail) and Jordan Sarrou (KMC-Ekoi-SR Suntour). When Schurter ramped up the pressure on the fourth lap, only Tempier could go with him, leaving van der Poel and Marotte chasing 13 seconds back. Schurter dropped Tempier on the penultimate fifth lap, while van der Poel dropped Marotte for third. 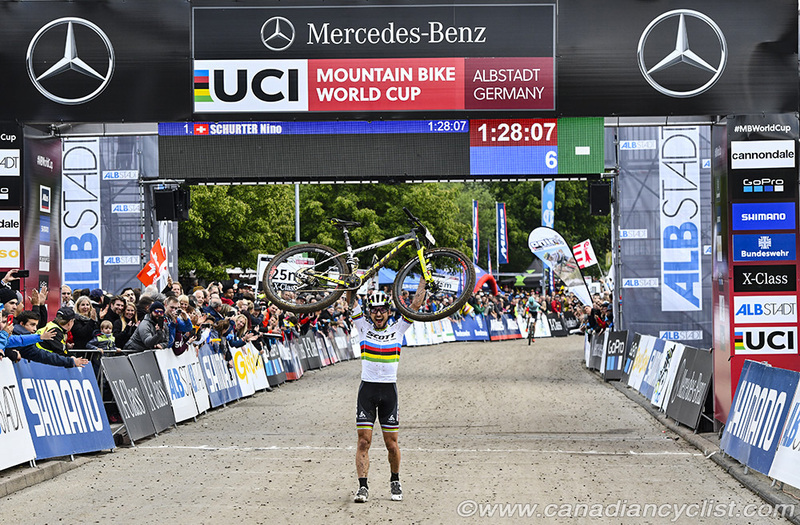 "It's a really good feeling to have my first World Cup win of the year," said Schurter. "I was quite disappointed after the Short Track, with the hard luck with a mechanical. It's a nice relief [to win]. The first lap I was lucky, I was able to ride well and into the first corner I was at the front. It's important to be at the front. Third row was okay, but it definitely makes it more difficult." Disera moved up steadily through the entire race, from 46th after the start loop, to 40th after Lap 1, then 34th, 30th and into 28th with two laps to go. Leandre Bouchard (KMC-Ekoi-SR Suntour) lost places on the start loop, but began to pull back spots in the second half of the race, to finish 34th. 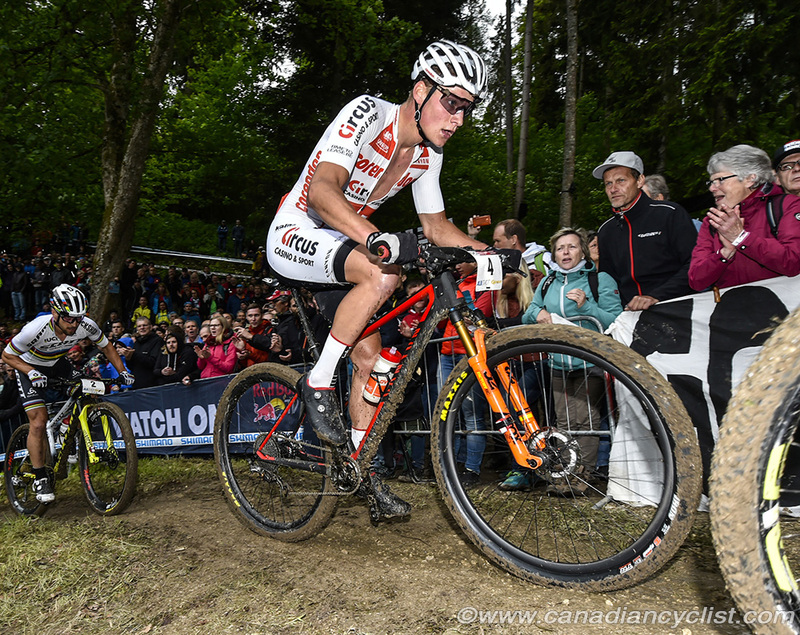 Raphael Gagne (Silverback OMX) was 57th and Andrew L'Esperance (Canadian National) 66th. "It was pretty wild," said Disera, "Haley [Smith] told the traction was pretty good, which made me happy, because here with the steep track, if it gets slippery it can be quite tricky. I rode well, except for an encounter with a tree, which caused me to lose six spots. I just continually fought and moved through groups. I'm happy with today, for sure." Schurter leads the standings with 450 points, a slim 15 point margin over van der Poel, with Marotte at 385 points and former leader Gaze at 350 points. Disera moves up from 45th to 38th and Bouchard drops from 36th to 39th. L'Esperance is 75th and Gagne 76th.